Travels largely around the non-league grounds of northern England rediscovering the soul of football in the early rounds of the FA Cup and other matches with a cup-tie flavour. I love the qualifying and early rounds of the FA Cup. I don't support a club; I support a competition. If you're disillusioned with the Premiership and all that then this is the place to come to rediscover what I call real football. OK, so the standard of play is inferior but that's to miss the point. The attraction of these little games is the atmosphere, the people, the sense of occasion and community, and the feeling that you're really part of it. Following the early rounds of the Cup is like tracing the source of a great river. It's extraordinary to think that what begins with a trickle in grounds not much more notable than public parks can end in the torrent of the FA Cup Final at Wembley. By that stage, of course, the millionnaires and TV moguls have long since entered the fray - and taken my ball away. I leave them to it. One final thing. I seldom describe the actual match in detail; you'll find better reports elsewhere. This blog is all about the spectating experience, the 'what it was like to be there' of the occasion. It never rained but it poured in Tadcaster last winter but the town and its club emerged triumphant. (I entered this article into the When Saturday Comes writing competition). The 2014-15 season had been full of promise. 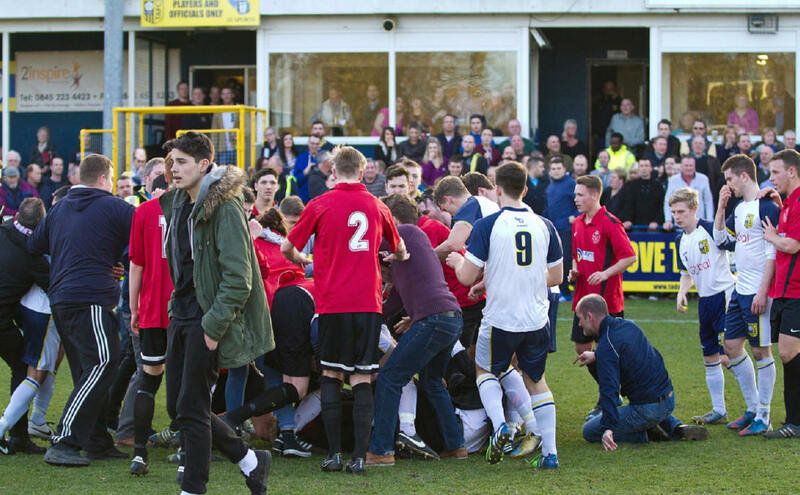 Tadcaster Albion reached the quarter-final of the FA Vase (the furthest they’ve ever been in the competition) but it all ended in tears and an unsavoury fracas at the final whistle with visitors from Highworth Town (see below). A three-horse race for the step five North Counties East League title with Worksop and Shaw Lane Aquaforce finished with similar disappointment, the momentum of Tadcaster’s campaign having suffered in the face of the Vase run. The manager, Paul Marshall, who had guided the club to its first ever promotion in 2010 and is best known for taking Harrogate Railway to the second round of FA Cup in 2002, surprisingly parted company with the club in summer to be replaced by Billy Miller, who had just led Railway to its highest ever finish in the step four Evo-Stik Northern Premier League first division north. 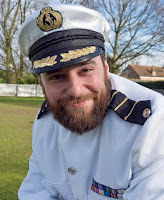 Since the club’s purchase by ambitious i2i Sports Ltd in summer 2013 the ground had been smartened up and, relatively unusually at this level, a vocal knot of supporters had become established under the cheer leadership of Captain Chickers (left) who comes to matches dressed in full white naval captain uniform. “I’m feeling Tad all over” sung to the tune of the Dave Clark Five’s Glad all Over had become their signature tune. Now regularly attracting gates of 250 plus, there was a buzz about the club and the scene was set for another memorable season – and so if proved in more ways than one. Tadcaster soon picked up where they’d left off and all was going well until the rains came. Sited just a wayward clearance away from the River Wharfe, the i2i Stadium had long been vulnerable to heavy rain, suffering regular postponements for waterlogging but the club never encountered anything like the water levels of last Christmas. The pitch, clubhouse, car park and surrounds were submerged in the several feet of water which had also pushed flat the sheetpiled perimeter fence. The cost of the damage was estimated at £300,000. 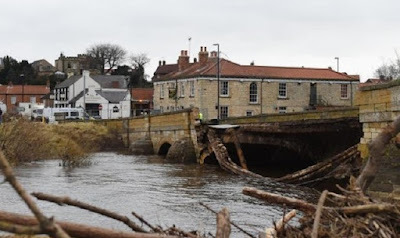 Storm Eva’s impact on the town made national news when the swollen Wharfe dramatically washed away part of the Grade II-listed Georgian bridge that binds the halves of Tadcaster together causing the bridge’s immediate closure and months of ongoing reconstruction. 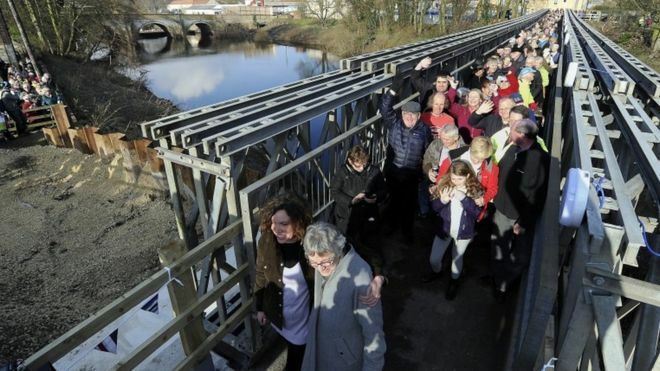 A temporary footbridge was suggested a short distance downstream from the damaged bridge with one abutment on land owned by the Samuel Smith’s brewery. (Nicknamed The Brewers, Albion were formed in 1892 as the club of the rival John Smith’s brewery also located in Tadcaster). Samuel Smiths, a huge employer in town, has had a sometimes strained, quasi-feudal relationship with the locals, a situation which was exacerbated when the brewery refused to grant permission for the bridge on its land amidst concerns that it would become permanent and demands to influence design of the reconstructed road bridge. Step forward Albion. The club offered land adjoining their car park from which bridge could connect to the bus station. The temporary structure was opened on 12 February, the same week as Tadcaster’s first home match for 73 days and the passing of one of the side’s biggest fans and club barmaid, 23-year-old Sonny Lang (right), who had lost her battle with cystic fibrosis. Following a minute’s silence before the match each player hugged Sonny’s mother at pitchside. 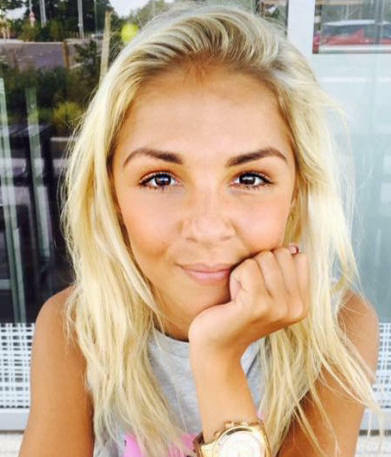 The club had raised £5,000 for Sonny’s fund in a charity match in October. Sonny’s Bridge, as the crossing was named, also proved to be a springboard. Tadcaster re-joined battle with Handsworth Parramore (which sounds more like a character from a Noel Coward play than a football club) at the top of the table, the clubs exchanging first and second place on an almost weekly basis. 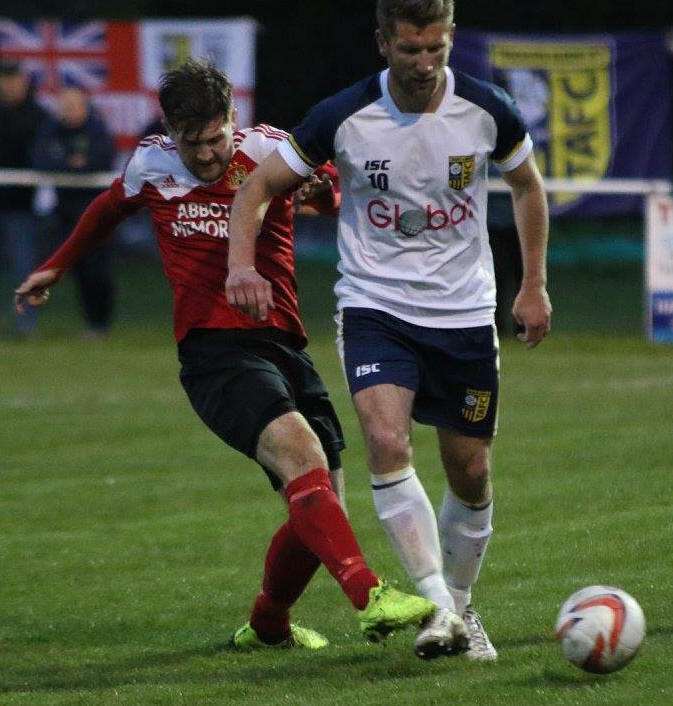 They met at Tadcaster on 9 April (see lead pic) with the home side securing a crucial 3-1 victory which set them up for the run-in. Faced with a fixture backlog, manager Miller recruited – and in style. He brought in Jonathan Greening (above, left), 37, brother of Tadcaster striker Josh, but much better known as the former Man United, Middlesbrough and West Brom midfielder. (He still feels sheepish about receiving a Champions League winners’ medal at United when he didn’t play a moment of the 1998-99 European campaign and only sat on the bench on “that night in Barcelona”.) Greening had played for Albion the previous season then briefly re-joined his first club, York, at the start of 2015-16 campaign. He left in December when he and Richard Cresswell (below, right), 38, another returning York alumni who made his name at Leeds and the Sheffield clubs, were surprisingly overlooked for the vacant post of manager. Cresswell also signed for Tadcaster as cover along with Seb Carole, who had also played for Leeds and boasted bona fide Champions League experience with Monaco. Another ex-pro on the club’s books is assistant manager Matt Heath who has turned out for Leicester. 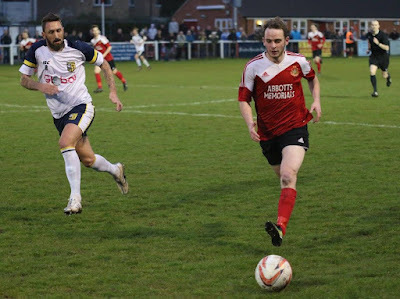 All four ex-Premier League players took to the pitch together for a victorious League Cup quarter-final against neighbours Knaresborough Town the week after the big Handsworth clash. Thereafter the wheels briefly threatened to come off the wagon. 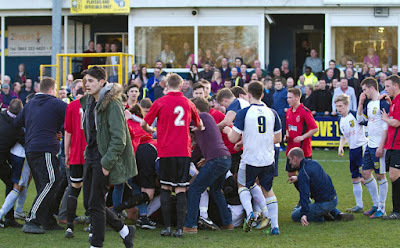 An away match at Pickering, now managed by Marshall, was pivotal. Albion were a goal down with three minutes to go but came back to win 3-1. A heavy defeat at Maltby Main, one of 10 games in April, followed but proved to be the last hiccup. 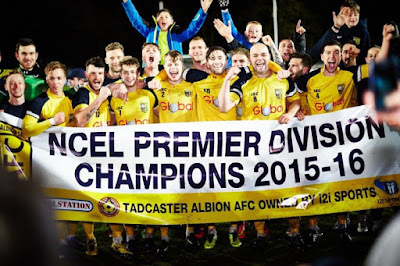 Tadcaster finally secured promotion and the title with a game to spare by defeating Armthorpe Welfare on a bitterly cold, stormy, hailing evening. (Five layers were only just enough). Not that the weather phased the denizens of the town given what they’d gone through. Captain Chickers was singing in a rain of champagne. 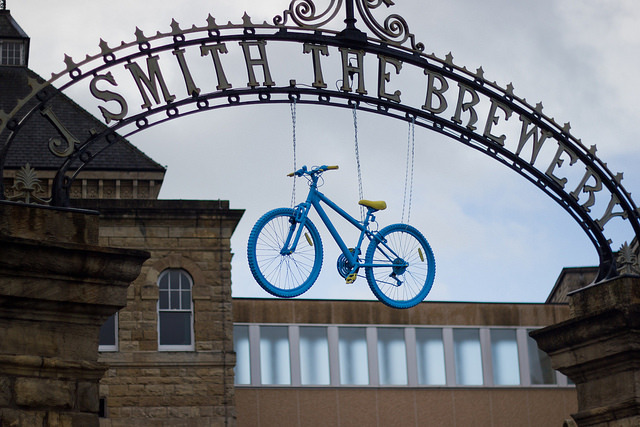 The next day the Tour de Yorkshire passed through Tadcaster, another prompt for the town to look forward. For a final flourish Albion came from 0-3 down at half-time in their last league match at home to Athersley to win 4-3. Taddy finally came into dock at the end of the season with defeat to Cleethorpes in the League Cup final on 14 May. But, heh, in the circumstances no-one cared too much. Bigger battles had been won. The club now anticipates its first ever season at step four in the Evo-Stik Northern Premier League. The i2i Stadium is being upgraded over the summer too with a new 240-seater stand and, to follow, a two-storey clubhouse with plenty of other flood proofing features in the plan, it’s safe to assume. I think this will be my final post. When I started this blog 10 years ago reading a report about your little club online was quite novel. Now the point of such postings and interest in them has been washed away by a tsunami of social media. Who wants to read 500 words about a match a day or two after it's happened when you get can endless snippets and pics about it as it happens? Well, I do but judging from the declining view counts for my posts I'm the minority. I'm also finding it a little harder to find interesting grounds I haven’t already visited and say new things about matches without being patronising. Increasingly I also feel like a nerd with a camera at matches. So, with three blasts of the whistle, that's it. That's a pity, I have enjoyed reading your reports and seeing you at the odd game. Good luck for the future. No Paul, please don't go! As a Northerner exiled down South, your posts make me yearn for my homeland. I love reading about all the grounds you visit and will really miss the 'Up for the Cup' emails that drop into my Inbox. Best wishes! I know exactly how you feel Paul, having parked up `oneeyeontheball` in November 2014 for similar reasons, endless hours spent composing a post and the apparent decline in interest started to reflect in the quality of my posts. Having said that, I thoroughly enjoyed the Road-trip. True enough, Periscope, Twitter and the vast array of technology has indeed made the blog look like an afterthought...but I honestly do still enjoy reading a good Blog and have followed yours for quite a while now. Thank you for the privilege and Good Luck for the future.!! Thanks for the compliments, guys. Congratulations to Ollers for being runner-up in the WSC competition - and see you at a northern outpost sometime next season I expect, Keith. Sorry to read you're hanging up the camera and notepad. Like the commenters above, I've always enjoyed your posts. Writing does get a bit tiresome sometimes and it's frustrating when you spend ages on something only to get a few dozen reads, but I hope to see you back posting sometime in the future. All the best! Thanks for the interest, Michael. I may yet resume the blog if I get sufficiently inspired - or perhaps do it on a smaller scale on my blog's Facebook page, Up for the Cup. It will be odd going to Binfield v N Greenford United in the Cup on Sat [I'm down that way for a family visit] without a post in mind, to be sure. Paul.